On the anniversary weekend of the battle, every three years, a full-scale reenactment takes place, attracting thousands of spectators. Here's a short video clip from a previous Civil War Reenactment. Enjoy! In the autumn of 1864, a pivotal Civil War conflict in Missouri took place in the Arcadia Valley. This was the Battle of Pilot Knob. It was even more important for what it prevented than for what actually occurred, since because of this event, there was no Battle of St. Louis to follow. At that time, the community of Pilot Knob was the southern terminus of the St. Louis and Iron Mountain railroad. In September of that year, an army of 12,000 Confederate soldiers led by Major General Sterling Price headed north from Arkansas toward St. Louis, with the objective of changing the course of the war west of the Mississippi. Along their way was Fort Davidson, with a garrison of only 1,500 Union soldiers, under the command of Brigadier General Thomas Ewing. 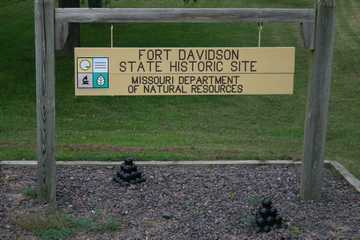 Price viewed the capture of Fort Davidson as a stepping-stone in his assault on St. Louis to follow. He expected that his overwhelming numeric superiority would quickly win victory, providing combat experience for 6,000 of his troops who were untested draftees, and that munitions captured at the fort would supply arms to those 3000 of his soldiers who lacked them. However, the fort was protected by a hexagon of steep earthen walls, surrounded by a moat that was dry but deep, with two long entrenched rifle pits extended outward from the walls. 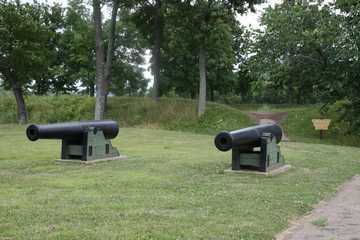 Four huge siege guns, three howitzers, and six artillery pieces had a clear field of fire for 300 yards in every direction. Even though Confederate artillery held the adjacent high ground on Pilot Knob and Shepherd Mountain, their frontal attacks on the fort resulted in nearly 1,200 casualties, while Union casualties were less than 200. The initial assault was broken, although Price intended for the battle to resume the next morning. However, during the night, with ammunition running low and little hope of prevailing for another day, most of Ewing's federal garrison escaped under the cover of darkness, leaving only a small detail of volunteers behind to blow up the powder magazine. When this great explosion occurred, the Confederates initially thought the Union side had suffered a catastrophic accident. However, when their escape became evident after dawn, Price realized that St. Louis would now be warned by Ewing of his army's approach. Although his Confederate forces captured the empty remains of the fort, the strategic battle had been lost. His mauled army turned west, then south after a defeat near Kansas City, and St. Louis was never again threatened for the rest of the war. The events of this battle are elegantly depicted by displays in the visitors' center at Fort Davidson State Historic Site. They commemorate the soldiers who fought and died on both sides. The remains of the adjacent fort can be toured as well.